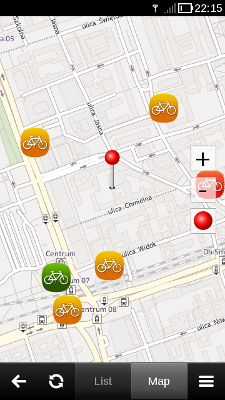 Cyklop is an application that supports you in using bicycle sharing service. It allows you to find free bikes or stations near you. Currently supports every system provided by Nextbike including more than 80 cities from Germany, Austria, Latvia, Poland, Switzerland, Turkey, Azerbaijan, Cyprus, the United Arabian Emirates and New Zealand.